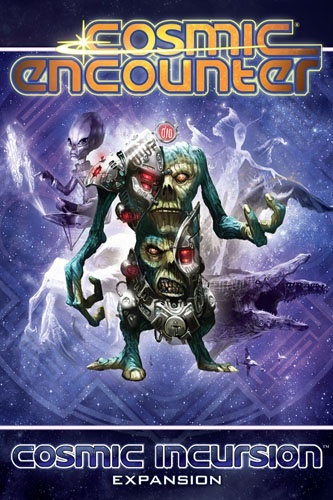 In Cosmic Incursion, the exciting expansion for Cosmic Encounter, 20 new alien races explode onto the galaxy! Players will face the sticky terror of the Fungus, scratch their heads at the perplexing Magician, and shudder in fear as the Locust consumes their planets in one gulp. Cosmic Incursion also makes the Cosmos even bigger, adding a 6th player to the game. Finally, as if that wasn't enough, Cosmic Incursion introduces a new variant to the game - the reward deck, which offers exciting new cards such as kickers and rifts to those aliens who ally with the defense.